To show the many provisional issues of Carpatho-Ukraine from late 1944 to the end of 1945. These issues are not listed in Scott, but there have been preliminary discussions with the editor concerning the possible eventual inclusion of at least some of these issues. This is a traditional exhibit, covering the issues listed in Michel under Karpaten-Ukraine. (See Michel Europa-Katalog, volume for Osteuropa, as well as Michel Ganzsachen-Katalog Europa bis 1960 or Michel Ganzsachen-Katalog Europa Ost). This collection will never be complete. The exhibit attempts to show all stamp issues as well as most major varieties. However, in spite of having collected this area for over 40 years, there are still many holes, especially in the overprinted issues. All overprinted stamps have been expertized. Many of the other items in the exhibit have also been expertized. Since this is not a popular collecting area, a stamp with an issue of 500 copies is considered common. The rarities in this area are the stamps of which 20 or fewer copies exist. This exhibit contains over 100 examples of these, including three stamps where only 2 copies are known, and eight others with only 3 copies known. In addition, the full sheet of the essay for the 200 fill�r of the First Definitive Issue is unique. Beneath each overprinted stamp the quantity produced is indicated. 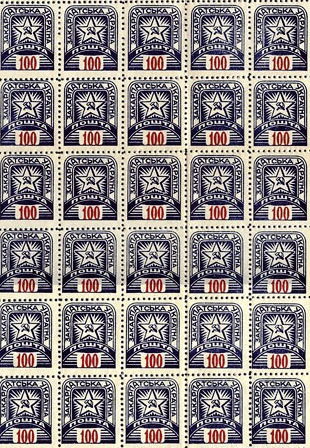 Stamps with 100 or fewer copies known are indicated in bold type. Stamps with 20 or fewer copies known are indicated in bold red type. There is a great deal of literature available on Carpatho-Ukraine literature (in several different languages). A comprehensive list of references can be found at http://www.jaypex.com/C-U/CUlit.html . The exhibitor recommends using any one of the following publications. Majer, Ji?�, ?eskoslovensko 1944-1945, Zakarpatsk� Ukrajina , Prague (2008) [Czech]. Carrigan, Jay and Kuzych, Ingert, Handbook of Carpatho-Ukraine Philately, Springfield, VA (2005) [English]. von Steiden, Georg, Spezialkatalog Karpaten-Ukraine / ??????????? ??????? ???????????? ?????? ?, Munich (2000) [German / Ukrainian]. These references are among the latest publications on this subject and are by far the most comprehensive ones dealing with the 1944-1945 issues. The 10 frame version of this exhibit will be available on my web site by April 1, 2010 or earlier. See http://www.jaypex.com/Exhibits/C-U. An earlier 9 frame version of this exhibit is also available on Exponet at http://www.japhila.cz/hof/0379/index0379a.htm.